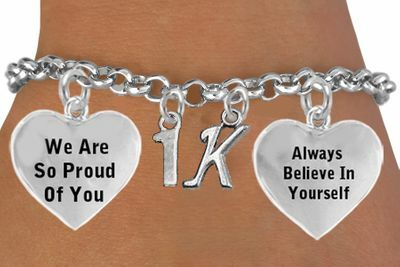 " RUN....RUN.....RUN, 1K TO 15K "
Exclusively Ours! An Allan Robin Design. Our Adjustable Bracelet And Charms Comply With All Laws, Lead, Nickel, & Cadmium Free!! Detailed Antiqued Silver Tone " Run...Run...Run, 1K To 15K Charm" & "We Are So Proud Of You" Heart Charm And "Always Believe In Yourself" Heart Charm Adjustable Bracelet. You May Also Add Additional Charms Of Your Choice On Each Side Of The Charms Shown Above, And See More Charms Below.